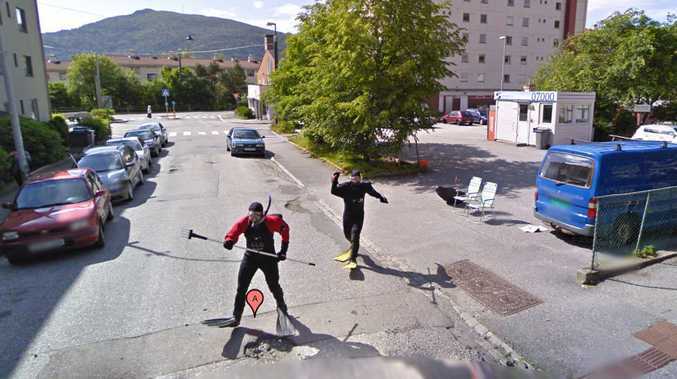 TWO Norwegian pranksters have been snapped chasing the Google Street View van while wearing scuba equipment. The men sat in deckchairs on the side of the road waiting for the van before giving chase with spears. 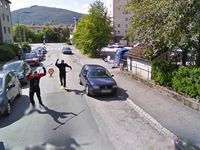 Norwegian newspaper Aftenposten tracked down the two pranksters who admitted they had insider information as to the van's whereabouts but never expected the media coverage the stunt has since received. “It was meant in fun, but we never imagined it would get such a tremendous attention,” Borre Erstad said of his and Paul Åge Olsen's new found fame. 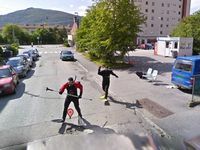 Aftenposten also reported the stunt happened in Norway's previous summer but was not discovered until a new version of Google's Street View was launched this week, including images from Norway.